A lot of people who use the perennially popular devotional book Streams in the Desert think it is by somebody named Charles, because the title page is signed “Mrs. Charles Cowman.” As an author, she successfully concealed herself under her married name, her late husband’s name. Her full name was Lettie Burd Cowman (1870-1960). The authors she cites are a who’s who of the late nineteenth century evangelical movement, especially the missionary, holiness, and Keswick side of the tradition: A. C. Dixon, A. T. Pierson, F. B. Meyer, Andrew Murray, A. B. Simpson, Charles Trumbull, etc. There are many paragraphs written by Cowman herself, but they tend to flow in and out of the quotations seamlessly. Her work in Streams is mainly a cut-and-paste job, yet somehow Cowman’s compilation of sources has outlived and out-sold most of the authors she quotes. Who reads Meyer and Trumbull today? Answer: anybody who reads Streams in the Desert, and almost nobody else. Streams is still in print in a major way: leather-bound, large-print, multi-language, hard-cover, soft-cover, e-book, daily RSS feeds, updated-language version, packaged for your graduate, etc. Something about Cowman’s editorial judgment brought all this material together in a classic form that has been used by millions of people around the world. The secret of her editorial success is probably that she wasn’t trying to succeed. Cowman really did produce the book for her own benefit. She wasn’t trying to reach a large audience; she was going through a difficult phase of life, and learning how to commune with God through the suffering. 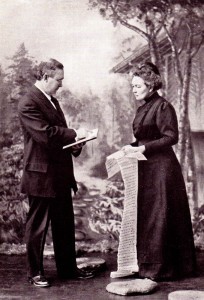 Lettie had married Charles Cowman in 1889, and five years into their marriage they responded to a call to world missions issued by A. B. Simpson in the Moody Church in Chicago. 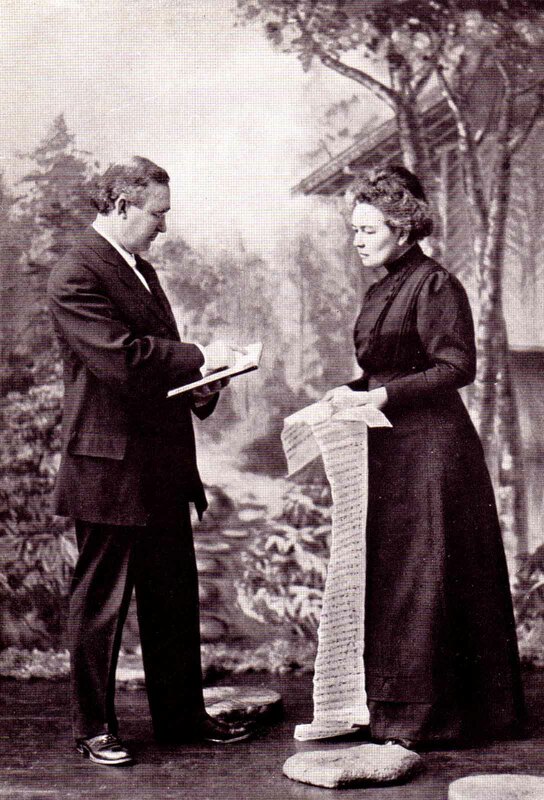 The couple served in Japan from 1901 to 1917, leading a remarkable evangelistic campaign that focused on distributing literature to every household and training indigenous Christian workers. Charles was a visionary, a gifted administrator, and an inspiring leader. Overwhelmed with the evangelistic success of his mission, Charles worked himself to a complete physical collapse. He and Lettie returned to the USA, settling in Los Angeles, where Charles died after a six-year period of sickness and decline. His biography, Charles E. Cowman: Missionary Warrior, was written by Lettie in the year after his death. It was during these six years that Lettie experienced the suffering that every reader of Streams in the Desert recognizes. For one thing, there was the great physical pain that Charles endured in his decline. But equally difficult was the enforced retirement that both Charles and Lettie were subjected to: The Cowmans were habitually busy people, with a lot of energy and a love for accomplishments. Holding still for six years was unimaginably hard and absolutely necessary. As they crept together through these six years, Lettie read through the Bible and a library of Christian books, gathering the bits and pieces that helped her the most. In a letter to a friend she wrote, “After getting coffee and early breakfast for Charles, I gathered poems and quotations to encourage his heart and mine. Later, I sent them forth to bless our missionary friends around the world. I called the book Streams in the Desert.” Lettie knew what she and Charles needed in these years: that is what provides the strong thematic unity holding together the cut-and-paste work of Streams. That’s why Christians in affliction will continue to find this book a word that speaks directly to their situation, in small daily doses. Lettie lived for decades after Charles’ death, and they were busy decades. By 1928 she took charge of the Oriental Missions Society that Charles had founded, and as she networked and promoted the society, she developed a ministry as a public speaker. Her labors as missionary stateswoman included travel to Wales, Ethiopia, Finland, Colombia, and many other places. And she kept writing. Though none of her books ever reached the classic status of her great best-seller, there was always a substantial reading public for anything by the author of Streams in the Desert. The follow-up volume, Springs in the Valley, is in some ways even better than Streams in the Desert, reflecting wider reading and a more comprehensive outlook. But it lacks the focus and intensity that somehow reaches out to readers in Streams. Her last book, Handfuls of Purpose, came out when she was 85. Lettie Cowman died on April 17, 1960.